A clove of garlic a day keeps the doctor and everyone else away and it tastes so darn good. 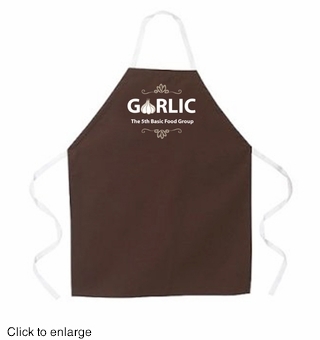 This beautiful brown"GARLIC The 5th Basic Food Group" novelty kitchen cooking apron will express ones pro garlic sentiment with refinement and class. Sure to be a favorite apron for any garlic guru.